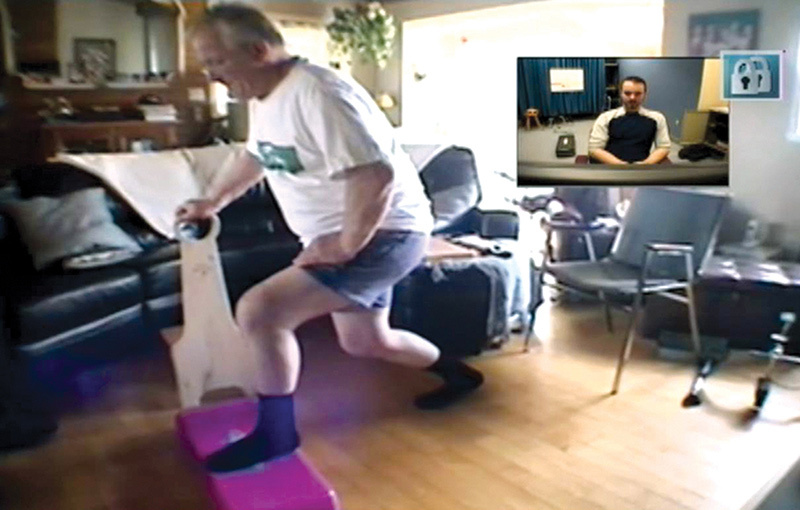 The trial conducted in Quebec, Canada, included data from 101 patients in the standard care arm and 98 patients in the “telerehabilitation” arm. Patients from eight hospitals participated. The study was published in July by the Journal of Bone & Joint Surgery. The therapy was a relatively strenuous, hour-long, 16-session, two-month course, said lead author Hèléne Moffet, PT, PhD, a professor in the Department of Rehabilitation at the Université Laval in Quebec City. Using the Western Ontario and McMaster Universities Osteo­arthritis Index, the researchers found that the gains for telehealth and standard care groups for post-therapy outcomes were equivalent for measures of pain, stiffness, and function. Outcomes were also equivalent in a secondary test, the Knee Injury and Osteoarthritis Outcome Score. Moffet said she was most impressed that there was a comparable rate of adverse events in both groups (two related to the therapy in the standard group and none in the telehealth group) and that there were relatively few personal visits in the telehealth group. Although 22 of the telehealth patients required home visits during the study period, most of those were for technical reasons involving the telehealth equipment. The actual number of personal visits comprised less than 3% of the telehealth total, she said. “The data show that we can do a lot at distance and that telehealth can be very useful, even in a big city, because you save a lot of time not traveling,” Moffet said. The physical therapists were trained on identical protocols for the in-person and telehealth visits. For the telehealth visits, even tasks that might have been performed by a therapist, such as massage of the surgery scar or moving the patella to improve motion, were left to the patients based on instructions from the physical therapist. The exercises focused on balance, weight transfer, mobility, endurance, flexibility, and strengthening of the quadriceps, hamstrings, calf muscles, and upper limbs. Patients were given charts to monitor their progress as they performed the exercises between visits. Because the telehealth therapists were not physically present during the sessions, there was a greater focus on safety, Moffet said. Techniques were developed to ensure patients listened and followed directions carefully. They had a chair or walker on hand for stability. The telehealth equipment included clinician-controlled pan, tilt, and zoom cameras and dedicated software allowing real-time two-way video and audio communication. A therapist did the initial installation to provide a proper setup, adequate space for exercises, and an opportunity to meet the patient. Therapists used an on-screen goniometer to assess range of motion and a zoom feature to check the condition of the scar or measure the knee for swelling. Monitoring the status of the knee also relied on patient assessments of factors, such as its warmth and answers to general questions that might signal an infection. There is a growing interest in telehealth in the physical rehabilitation community, but it is a step away from the hands-on approach most physical therapists are familiar with, said Alan Chong W. Lee, PT, PhD, an associate professor in the Doctor of Physical Therapy Program at Mount Saint Mary’s University in Los Angeles, and an observer of telehealth for the past decade. Moffet H, Tousignant M, Nadeau S, et al. In-home telerehabilitation compared with face-to-face rehabilitation after total knee arthroplasty. J Bone Joint Surg Am 2015;97(14):1129-1141.